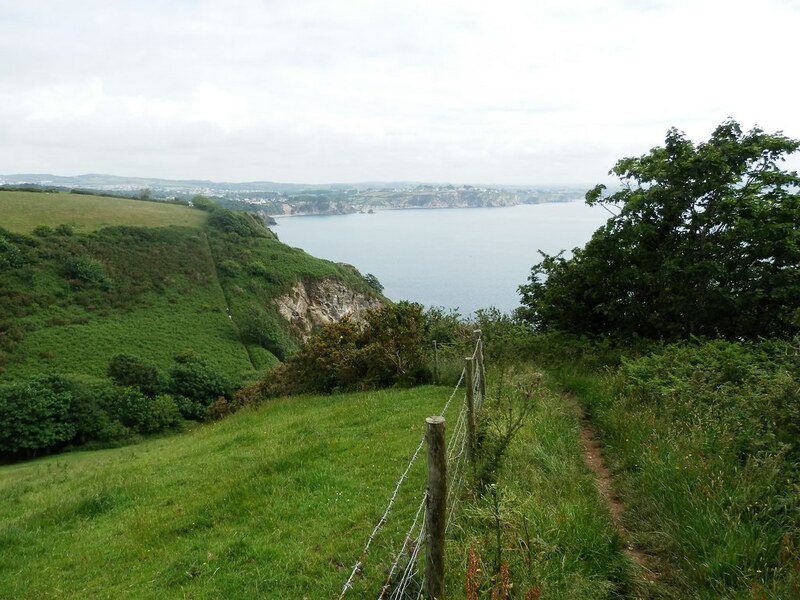 Every year from 2008, my Dad and I have walked a section of the South West Coast Path (SWCP), taking 4-5 days per section, and walking anywhere between 40 and 60 miles, depending on the terrain and logistics. Some years my brother has also joined. Having decided to do the SWCP the “wrong way” around by starting at South Haven Point and walking clockwise to Minehead, we’ve now reached south Cornwall. Last year after a lot of planning and some torment finding suitable accommodation, then being really happy with the resulting plan, it was dismaying when, at the last minute, the trip was threatened by family illness. Eventually, I ended up heading to Plymouth on my own, with the slight possibility that Dad might join part-way through at Looe, although this never happened. I then cut the walk short myself and bailed at Par to get home. Simply forget 2012 ever happened and start at Plymouth, trying to re-use as much of last year’s plan and accommodation arrangements as possible. Resume where I finished last year at Par, although this meant Dad skipping a chunk. 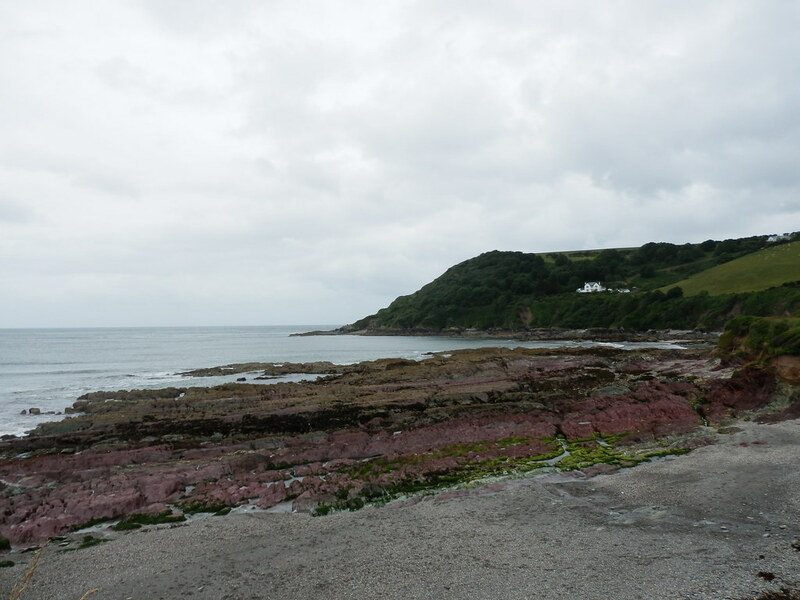 Starting this year’s walk in Looe, repeating the last two days of 2012 and continuing onto Falmouth. The bit missed out from Plymouth to Looe was not considered a great loss scenically. As you may have worked out, we went with option 3. Although I think Dad would like to walk the whole path in an ideal world, we’ve already missed a bit out when we had to abort below Golden Cap in 2009 in high winds, and whilst I fully intend to fill that gap in at some point before finishing the path, it does tend to make it easier to contemplate allowing other gaps to arise. Given he’s not getting any younger and this year has intimated he doesn’t know whether he will finish the path, Dad clearly wants to focus on good bits of the walking and is more open to leaving out the less good bits. So starting in Looe was considered to give the best two days of 2012 without making me repeat too much of what I’d already done. First map out the route and work out approximate daily sections, keeping an open mind about whether the first and last days are full or half days, and getting an overall idea as to what I’m dealing with in terms of river crossings and distribution of accommodation. That was already done for 2012. Research the travel which usually clarifies when is the best time to travel, and hence whether we get any walking done on the travel days. 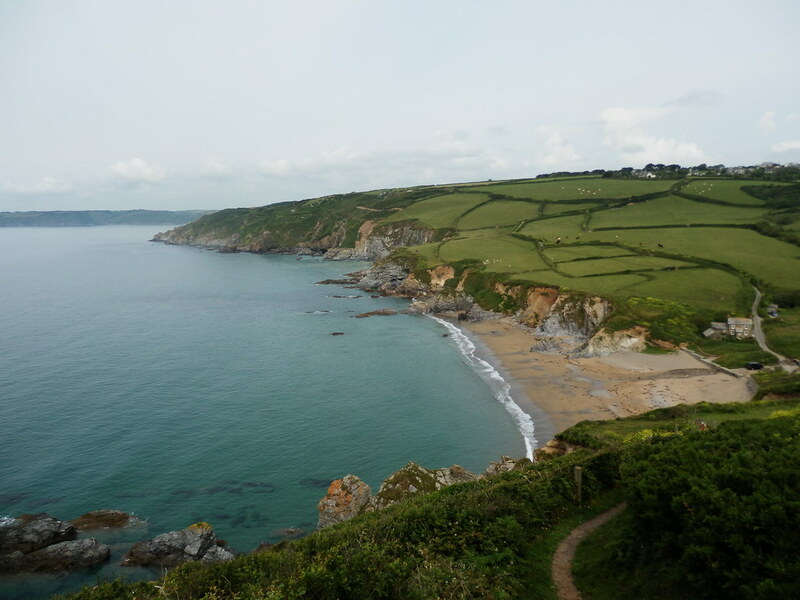 Now deep into Cornwall, the travel time is such that it’s a no-brainer – we start the walk the day after travelling down. So this year the only matter to worry about was dates and prices. Work my way chronologically along the path researching accommodation and building a shortlist. I then look at whether this causes any excessively long/short or overly challenging days walking. I don’t like to start booking accommodation until I’m reasonably sure that I’ve got options for the whole walk. I already had this knowledge from last year, and my start point was last year’s bookings. Book the accommodation chronologically, which allows me to adjust the daily walks and deal with the knock-on effect for the following nights’ accommodation. This year I simply contacted or looked at availability online, in order, of the places I stayed last year, and if possible I booked them, or if not I found an alternative. With all accommodation booked, the train tickets could be bought and seats reserved. 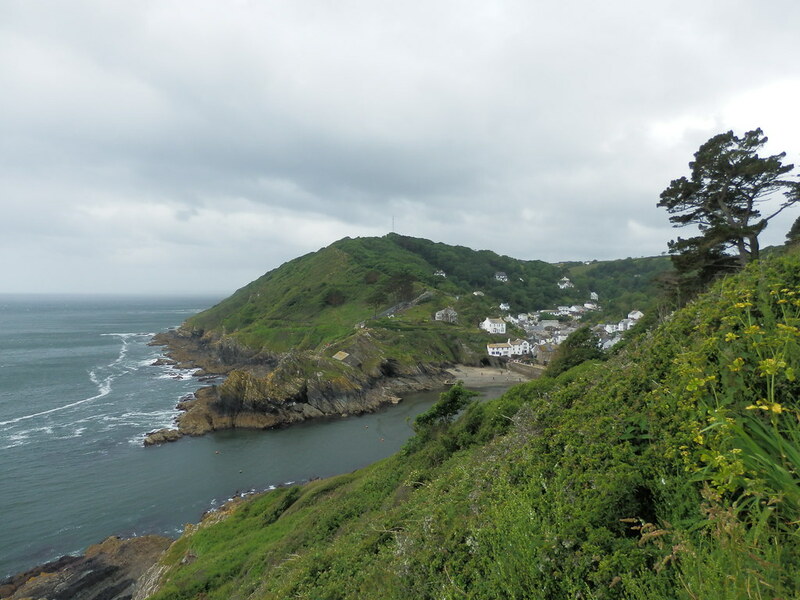 I was unable to book the place I stayed in Looe last year (Pencarrow) which was a shame as it was good, but found an alternative that avoided having to walk up a hill, thereby pleasing Dad. 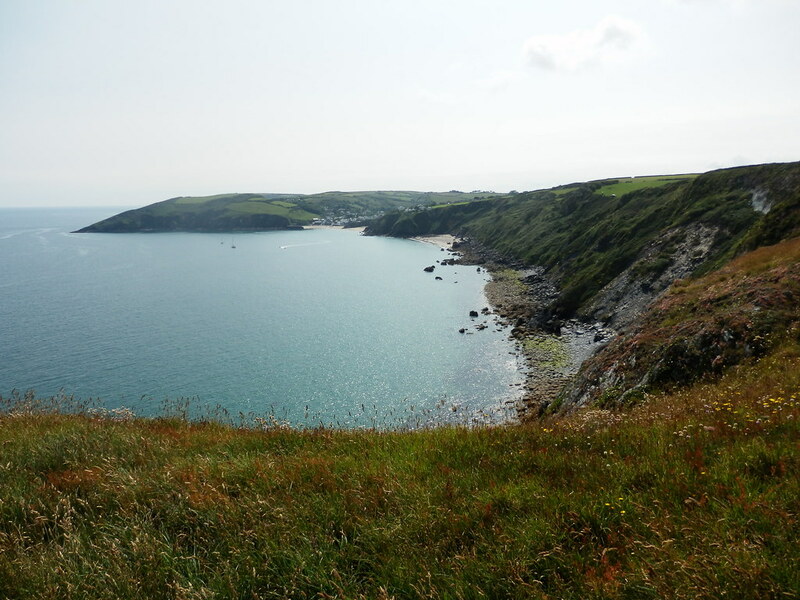 Looe is particularly difficult to book a B&B for walking the coast path, as the majority of B&Bs require a two night stay, especially at weekends, and some of the prices are a bit high too. I was quite lucky to find Little Harbour Guest House for a single night (on a Saturday) and at an ok price. I knew from last year that Fowey would be a problem, as I’d really struggled to find a B&B there. A hotel, no problem, but I didn’t want to pay those sort of prices, and Fowey is a bit of a pricey place to stay and eat. I couldn’t believe my luck when I managed to book the place I stayed last year, the Well House, and indeed the same room. I’d enjoyed my stay there, it’s in the centre of town and is very friendly. Night 3 was a problem too. 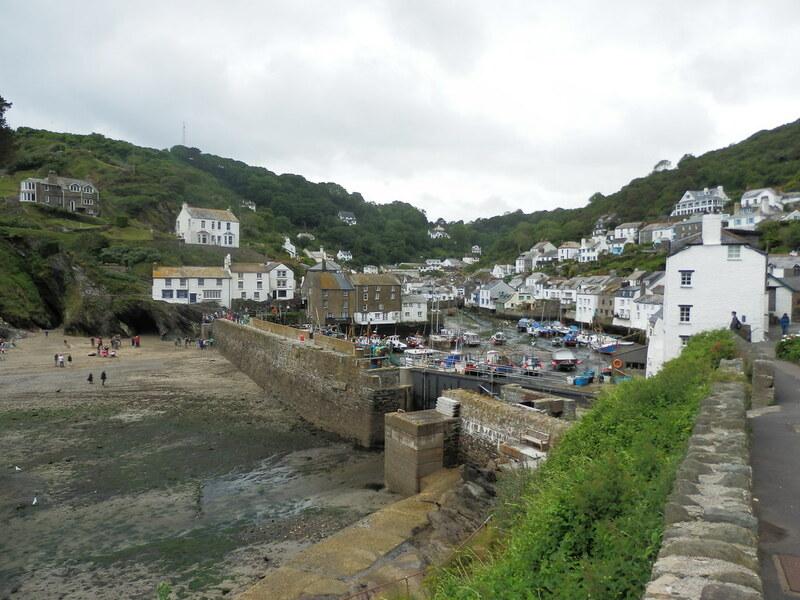 Charlestown is a bit like Fowey in that the only places there seem to be a notch in quality and price above what is ideal for us when walking the path. Indeed many of them seem to be positively anti-SWCP if there policies and pricing are anything to go by. It was impossible to find a single night stay in Charlestown, even if I’d been prepared to pay the prices demanded. So I had to look inland to St Austell, a mile and a bit inland. I managed to find Pen Star House on the near side of town, which location-wise was as good as I could have done, and was the best price night of the trip at £55 for a twin compared with the going rate most nights of £70. Not surprisingly as we walked inland to Pen Star, we passed several B&Bs with vacancies. I also tried to book the place I’d lined up in 2012 in Gorran Haven, but they couldn’t take me because they were closing for a couple of weeks for family reasons. But they put me onto Swiftshore, which was a massive stroke of luck. Friendly to deal with from the start, it turned out to be the best stay of the trip. The only downside was the uphill walk at the end of the day’s walk. From the start the youth hostel at Boswinger was out, as Dad wasn’t keen on the whole concept, and as it turned out it didn’t look to have availability anyway. The final night was very tricky to arrange in 2012, with Falmouth too far to reach in one day, and not much else at the right distance. Portscatho didn’t have anything, and I ended up googling all of the hamlets and major farms within reasonable distance of the path. This turned up Trewithian Farm, which I booked for 2012, but never made it as far as. I had however, managed to cancel my 2012 booking and get a refund, all online. So for 2013, I went straight to their website to see if I could book and managed it. 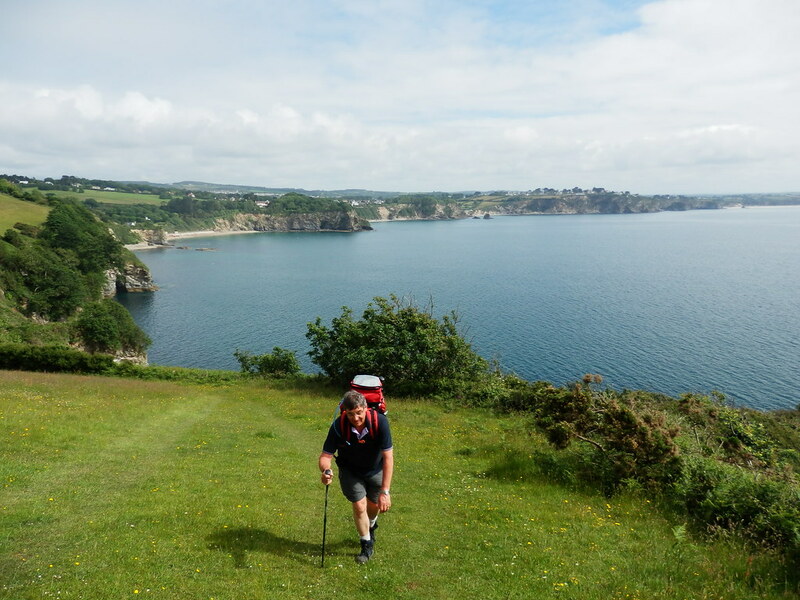 The walks themselves were planned as 10-12 miles most days, with one 14 miler to Trewithian Farm, and the following final half day of 7.5 miles into Falmouth. 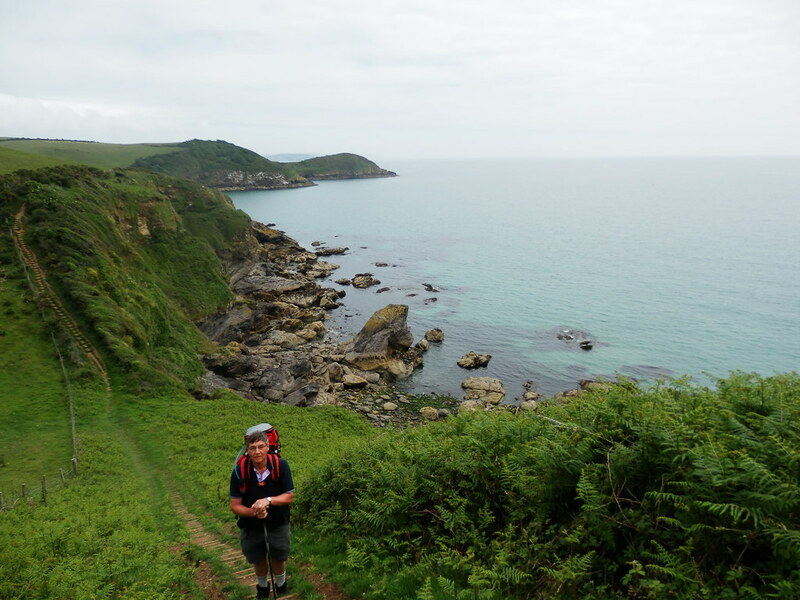 I also had to factor in river crossings – from Polruan to Fowey at the end of day 2, and from Place/St Mawes to Falmouth on day 5. Day 5 in particular concerned me – our train tickets meant we had to be on a particular train, which meant we had to make particular ferries and hope the connection worked, and we had to knock-off the walk in 3 hours or so. The risk was that having had the hardest day the day before, tiredness would prevent us zooming along as we needed to, counterbalanced somewhat by the fact that we’d probably have gained a little bit of fitness over the course of the walk. In complete contrast to my journey down last year, when I’d had to stand all the way to Exeter on a packed train, we actually got seat reservations this year, and the journey was much more pleasant. We pulled out of Exeter, and I started looking out of the window more ready for the best bit of the entire line – where the train runs along the coast through Dawlish and Teignmouth, and where we walked on our 2010 SWCP trip. The train got increasingly raucous as we made our way across Devon, becoming unbearable at Plymouth, just through sheer weight of noisy locals. Most of these then seemed to transfer to the Looe branch line at Liskeard. The single carriage train set off and five minutes later just stopped. Bizarrely, the driver then walked through the train to the other end and set off back up the track, before taking a fork. One of those moments when you begin to question whether you’re on the right train. 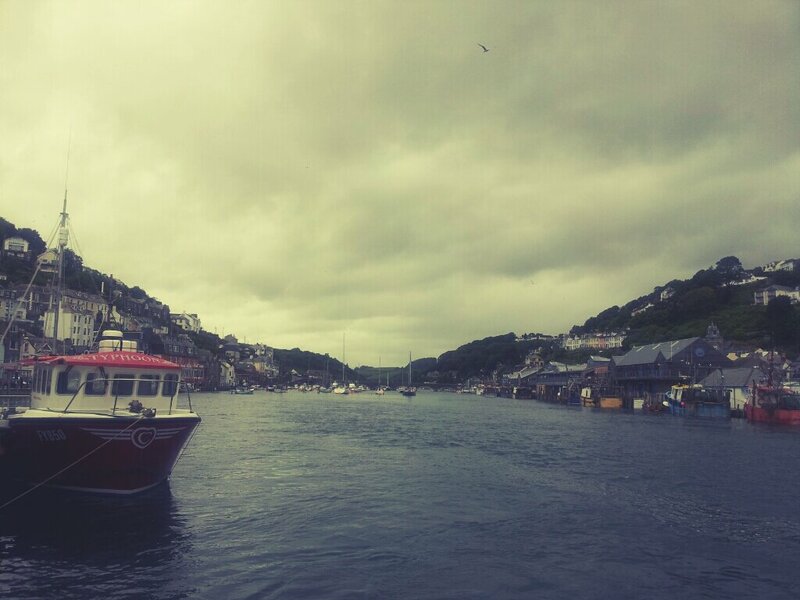 Some light rain greeted us as we alighted in Looe, and for the only time on the whole trip I had to put my coat on. We crossed the bridge into West Looe and went to find our B&B. Our room (the Lilac Room) at Little Harbour, although not huge had enough room to move about and had everything we needed. It was ensuite too, albeit behind a sliding door. Our shower was pretty ineffective too. A window seat with built in mini-table gave it an air of being in a caravan. We were sat there having a cup of tea when the sound of a key in the lock heralded another guest trying to break into our room. It seems he was looking for the owner as he’d managed to break his toilet. Amusing on the face of it, it was less so when it transpired that his was the room directly above our own, and his use of the phrase “burst pipe” was not comforting. A massive over-reaction it turned out that in the violence of his attempt to flush the toilet (I don’t want to think about what he may have deposited that needed that sort of vigorous flush), he’d cracked the ballcock. We didn’t get flooded. The owner recommended the Salutation Inn for dinner, as being the best pub in town, and this was fortunately where I’d ended up last year, so I knew both where it was and what we were likely to get. Sadly though, the place was heaving when we stepped inside, with nowhere to sit and it was also stiflingly hot. Neither of us fancied that and we retreated to the street to take our chances with the more run of the mill pubs, using the highly scientific selection criteria of seeing which had the “safest” menu. The Ship, where we ended up, could best be described as adequate. The food was fine, if unremarkable and I would classify it as unmodernised pub group – scampi, half roast chicken, that sort of thing. A pleasant pint of St Austell KSD disappeared down my neck. Breakfast was ok, and we’d managed to pull it back to 8am from the default of 8:30. I really wish I knew why so many B&Bs have 8:30 as their breakfast time, which is far too late for us. I suppose it’s a compromise to allow people to lie in whilst still containing the breakfast service into a manageable time period. But we tend to find the SWCP trip is a constant round of negotiating earlier brekkie times. In any case, the bacon was quite nice and plentiful, and there was some fruit, the criticality of which cannot be underestimated – often our whole post-stay rating discussion can turn on whether there was fruit available at breakfast. The only thing really wrong with breakfast was the strength of the orange juice which seemed as though it had been watered down (or maybe kept in the bathroom of the room above ?). We left the B&B mainly with the impression of the friendliness of the owner, and the fact that the facilities and breakfast were pretty much what we expect of the sort of places we stay at on the SWCP. We summed Little Harbour up as “benchmark”. 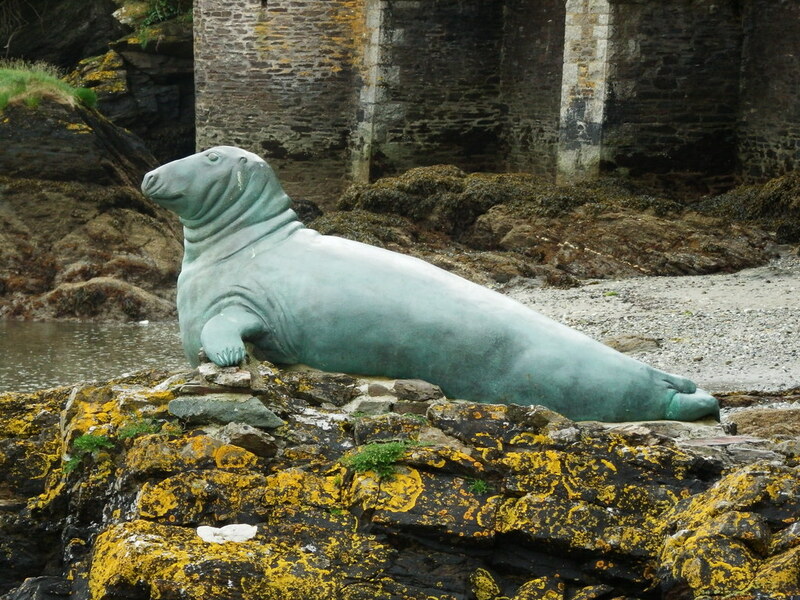 We walked along the river mouth to climb up to begin the walk proper, passing a statue of Nelson, a grey seal who made Looe his home. We walked through Hannafore under grey skies, through a gate and then we were onto the cliffs. Taking time to find our walking rhythm on our first day we made our way sedately west and then south to look out over the Hore Stone, and the first sight of the gnarled rocky shelves that are a feature of this part of the coast. Around Talland Bay, where there were plenty more nice rocks and then we climbed up to Downend Point and the start of the “halfway up the cliff” walking, that makes the prediction of the ascent and descent so difficult on digital mapping, but which fortunately usually leads me to overestimation. 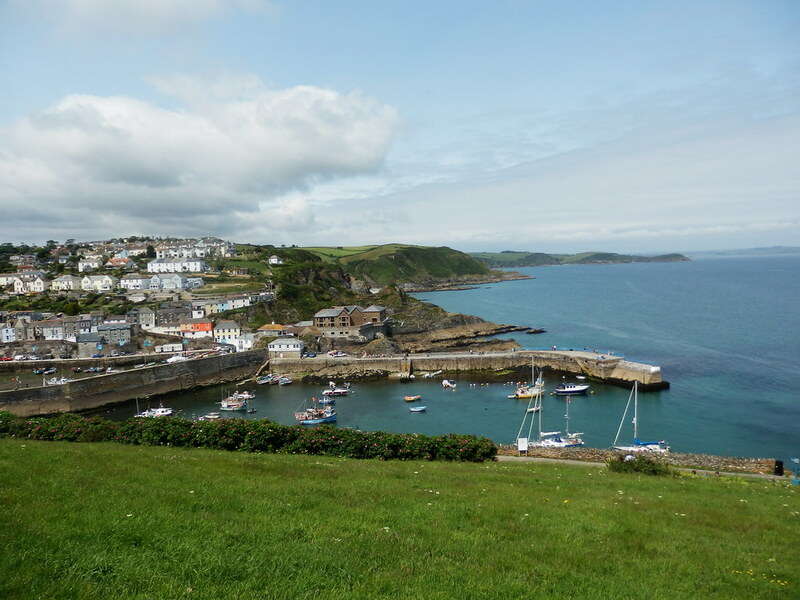 We descended into Polperro and took our coffee stop overlooking the harbour. 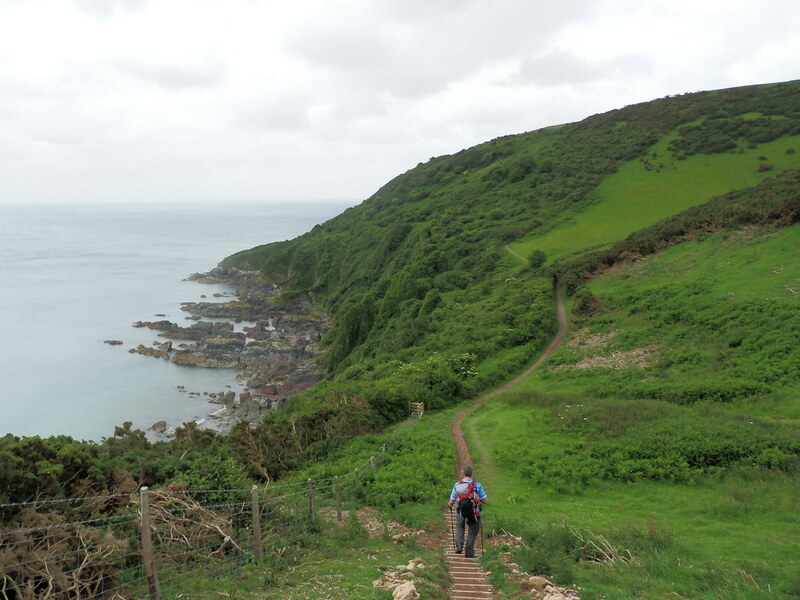 Now began a succession of steep climbs and descents that were to last the rest of the day, and which I associate very much with the Cornish coast. We stopped for lunch at the side of the path above Penslake Cove before resuming the rollercoaster. A picture of Shag Rock was duly taken by special request from @wellycath as we started the way around Lantivet Bay and the longest part of the day. Pencarrow Head seemed to take ages to arrive, but come it did and seeing the tower on Gribin Head, which we would pass tomorrow, signalled that we were approaching Fowey and the end of the day. It was at this point that Dad broke his brand new Mountain Warehouse trekking pole, leaving me with a sense of guilt for the rest of the trip that I was zooming along on Pacerpoles, while he was down to one pole and one of dubious quality at that. 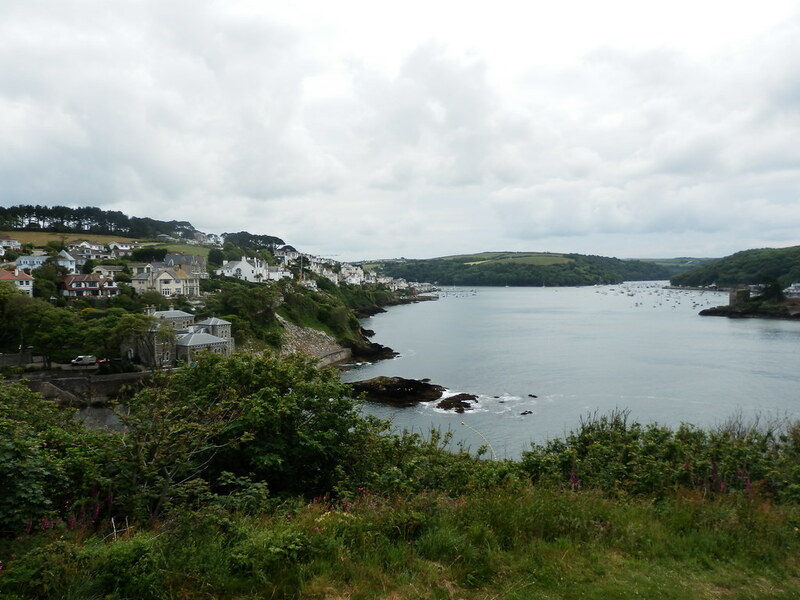 A big descent from Lantic Bay brought us into Polruan and the ferry crossing to Fowey. Having stayed there last year, I took us straight to the Well House and we were shown to our room – the family room that, ironically when there was only one of us, I’d been upgraded to last year. A double and a sofa bed separated by a door, separate TVs for each “room” and free wifi, made this one of our more luxurious stays and also prevented arguments about what to watch when we retired from the pub. After the expected fruitless search of Fowey for somewhere to eat that met our requirements, somewhere reasonable but not over-priced and with dishes other than seafood on offer (tricky to achieve in Fowey), we ended up where I ate last year – the Galleon. A steak and a couple of pints of Cornish Rattler disappeared down my neck. Frank, the napkin stealing labrador, kept us company at breakfast, which was up to the same standard as the previous year – the worst that can be said about it being the slight fizziness to the orange juice. I can recommend the Well House, which also happens to be the oldest building in Fowey. The owners, Tim and Paula couldn’t be friendlier, the room was good and so was breakfast. The same price as the B&B in Looe, it had the edge because the quality was that bit higher. We stepped outside to another grey start and I wasted several minutes faffing about with technology as the Spot seemed to be hungry and had to be fed batteries, and then didn’t want to connect via the phone app. I got it going in the end and we made our way through the streets up to St Catherine’s Point. 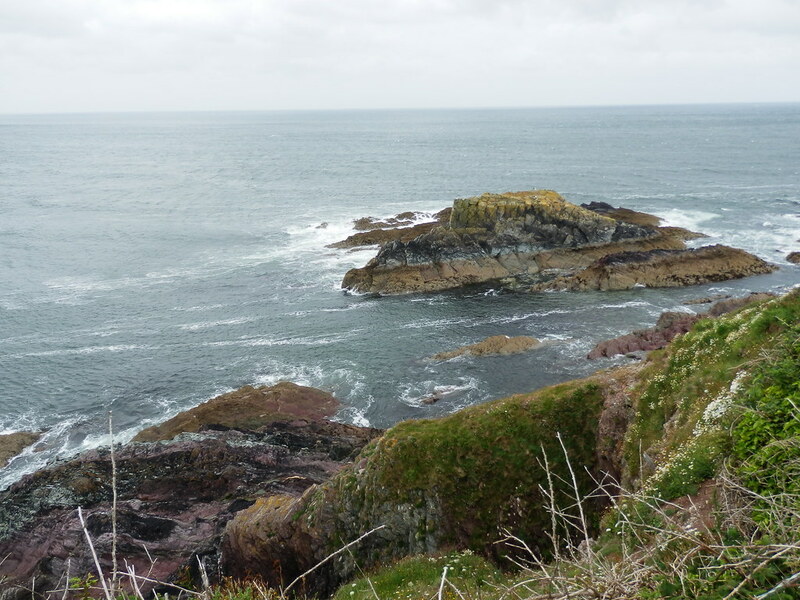 A couple of ups and downs later and we were at one of the places I remembered from last year’s walk – Polridmouth. Remembered for the sizeable house set practically on the beach with its own lake behind. Seemed like a good place to live – at least if you don’t mind coast pathers traipsing past your front garden every day. We climbed back up on the gradual pull up to Gribin Head, where we turned the corner and started heading roughly north towards Par. A straightforward clifftop walk to Polkerris brought us there at a convenient time for coffee on the beach. A path closure due to a big chunk of cliff fallen into the sea meant a big detour by road along the Saints Way, but on the “advice” of a local, who’d seen people go along the closed section and not come back, we tried it anyway – guessing that there would be a way around the obstacle, albeit maybe one requiring a bit of trespass. We passed the spot where the permanent diversion was being constructed and where we spotted a hi vis jacket. We snuck past along the real coast path to have a look at the reason for closure and it was perfectly obvious that we could go no further. But by the same token we also didn’t fancy a two mile detour because of 50ft of disappeared path. We opted for a possible confrontation and clambered up the half made steps to the field above where the path used to be. Our worker sat in his four wheel drive watching us walk past and sloping down the field alongside a new barbed wire fence. We reached the corner and we were, literally, cornered. No way through, no stile. It was retreat or dicing with a climb. A careful climb got us to the other side, but ironically it was the next field boundary that caused the problem. A ruined stone wall, no more climb than some of the stone wall stiles on the path itself, and I got across easily then waited for Dad on the other side. A trail of blood down his arm as he reached the ground on the other side having snagged his arm on a prickly branch and we had our first proper injury of the walk. Drips of blood waymarked our trail to the gate at the corner of the field. Thankfully it opened, and we were back on the coast path. Soon we passed Little Hell, which seemed apt given the recent excitement, as we made our way down to Par Beach, where a more thorough treatment of the half-severed arm was performed, me taking great delight in finally using an alcohol wipe from my first aid kit, and even more delight in the grimace that accompanied its deployment. We stayed for lunch on the solo bench we found on the beach, and a crushing disappointment awaited me. Every day on this walk we bought bread or rolls and made our own packed lunches. Today, in a hurry I’d grabbed a pack of cooked beef from the shelf, and now realised that it was garlic beef. Now I don’t a bit of garlic in cooking, but not as the primary flavouring. It was now my turn to grimace as I attempted to force the comestibles down my neck. I couldn’t finish my lunch and worse still there was still some beef left. The powerful stench of it stayed with us seemingly for days. A big inland detour around the china clay works started off the afternoon, but after a load of alleyway walking we were back on the cliff and looking across the bay. The next half hour was spent walking along the cliff next to the golf course. Charlestown arrived and we walked uphill past several B&Bs with vacancies to our booked accommodation on a main road on the outskirts of St Austell. Nice. All afternoon we’d been predicting what awaited us at Pen Star House – the cheapest B&B of the trip at £55. So our predictions centered around the classics – an avocado bathroom suite, bedspreads rather than duvets, mismatched furniture and loads of signs. We arrived half an hour early, and adjourned to a patch of grass around the corner to laze in the sun and wait it out. When we finally arrived just after 4pm, we had to wait for another couple (Dutch I think), which is totally fair enough, but enduring a constant lament from the owner about everyone turning up at the same time while she labouriously did the foreign guest check-in routine and we stood like spare parts in the hall was less so. Only after they were being shown to their room did we get given the check-in forms to complete. I don’t mind waiting but being alternately ignored and then given daggers is not on. We got to the room, and although there were bedspreads and the bathroom was a retro sky blue colour, the standard of the room was actually pretty good. I reckon the main reason for the reasonable price was that people just don’t like having a separate bathroom nowadays. But as predicted there were a few signs and I got a bit sick of being reminded in print that this was “their home”, and the sign, comprising their environmental policy, that said “WE don’t take baths, we use the shower” just came across as snobby and patronising, especially after the “warmth” of our welcome. Of course if they’d just taken the bath plug away, they may have been more effective. Somewhere on the way to dinner, the key phrase was uttered: “I think we should form an escape committee”. We risked the landlady’s displeasure by completely ignoring her dinner recommendation of walking back down to Charlestown where the better places to eat are. Maybe it is, but a two and a half mile round trip walk to eat expensive seafood is an incredibly hard proposition to sell to my Dad after a day walking. Put simply, in his eyes a real pub doesn’t serve scallops. So we headed into St Austell and took our life in our hands in the town centre. Rejecting the first few on the highly scientific basis of not liking the look of the people hanging around in their doorways, we eventually found ourselves in Wetherspoons. Two years ago when we spent two nights in Plymouth, it was hard to prise Dad out of Wetherspoons where we went for dinner and breakfast, so tonight this was an easy sell. I hit the scrumpy. This was the second trip in a row where I’ve found myself in Wetherspoons as seeming the most upmarket option available. It all fell apart at breakfast, not that it was together that much in the first place. I made a massive error of judgement in believing our welcome the previous night to have been an unfortunate one-off. With the slate wiped clean I sat down to order breakfast. Three breakfasts into the walk and the full english starts to lose its appeal, so I requested poached eggs with a sausage. A stinging “No” came back – it had to be an exact dish on the menu given the large choice of dishes they were offering, as he waved towards the specials board (which was all fish). I sat there stunned for a moment (as did the rest of the room) – I was asking for less food than I could have, and no real extra effort. Manners threatened to desert me as I gave a big sigh and gruffly said to just bring me the eggs on toast then. Having taken one for the team, everyone else was as good as gold and ordered carefully from the menu. I sat eating my breakfast, the quality of which was good by the way, but the taste of which was soured beyond redemption by how I’d just been treated. Don’t get me wrong, Pen Star was really good value, presumably because of the location and the separate bathroom, but I still wouldn’t stay there again if you paid me. I might even have said nice things about their home made art on the walls if I could have warmed to them as people – suffice to say that he’s a more talented painter than she is a photographer. I wasn’t surprised that they took down my (not offensive but far from glowing) review, as they also didn’t seem the type to be able to take criticism. So I got them with Trip Adviser instead. Their response to that confirmed that they’re not geared up for criticism and also hadn’t actually properly taken in what I’d said anyway. Apparently I’m a thoroughly objectionable person with the manners of a baboon and it was all my fault. We dodged the searchlights, barbed wire and patrolling guards and made good our escape from a thoroughly disappointing B&B experience, heading back down to Charlestown to pick up the path. Good time was made as far as Porth Pean, and we chuckled at the landlady’s insistence that today’s stretch was the hardest section of the coast path. That’s when we hit the weeds that the late spring seemed to have sent into a frantic last minute growth spurt and which overgrew the path for much of the walk. With that, and a nicer day weather-wise, of course came hay fever and I spent much of today’s walk sneezing and wiping and groaning. Some confusing waymarking and a variety of path options on the headland above Trenarren felt like it added a bit to the walk on a day when the mood wasn’t really inclined towards extras. We descended steeply from Black Head to Hallane and then immediately started climbing steeply again. We reached the top and looked for the first viable coffee-stop spot – basically anywhere where we could sit off the path without a bum full of nettles. We got on our way again and persevered until lunch, which we took sitting on a bench in Pentewan. 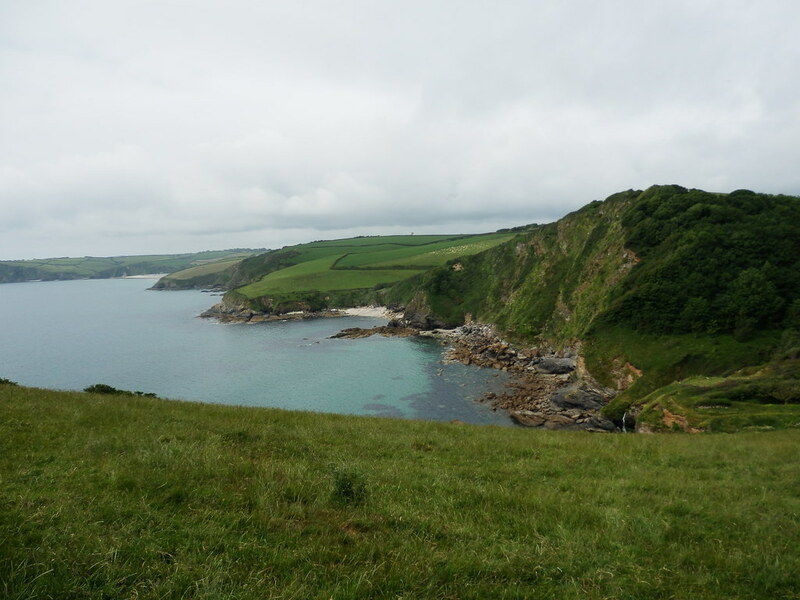 Feeling it because of the hay fever, I dragged lunch out for as long as I could, but eventually we had to get going and climbed back up onto the cliffs to head for Mevagissey. One ice cream later and we dug deep for the final stretch to Gorran Haven along roads and cliff tops. We pulled up the hill out of the village to our B&B, glad to finish the walk. 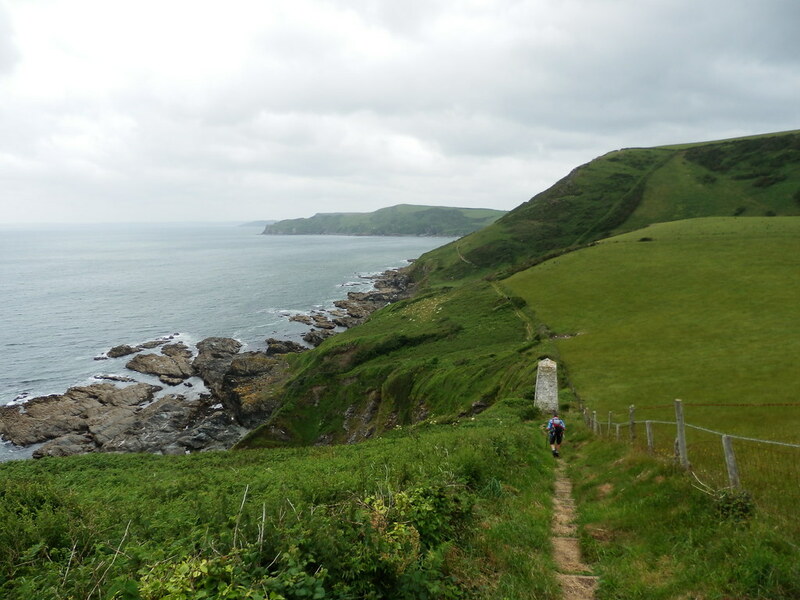 It had certainly been hard but in terms of distance and ascent was pretty much the same as day 1, and what we’ve come to expect on the Cornish part of the coast path. What had made today a trial was the hay fever and the undergrowth. Swiftshore was a total contrast to the previous night’s offering. Not really recognisable as a conventional B&B as it was really a guest room in the owner’s bungalow and was really like staying in someone’s home. Indeed we were made to feel like one of the family, and were laden down with welcome extras such as a coolbox with fresh milk, iced water and fruit juice, a torch for a late return from the pub etc etc. Not a sign in evidence, and indeed there wasn’t even anything outside to proclaim Swiftshore as a B&B. We were offered a lift to/from the pub, but ended up walking, and worth the walk it was too. Breakfast was good and made better by the fact we could have it as early as we wanted. Consequently we were on our way before 9am, even after a lot of lingering and chatting. 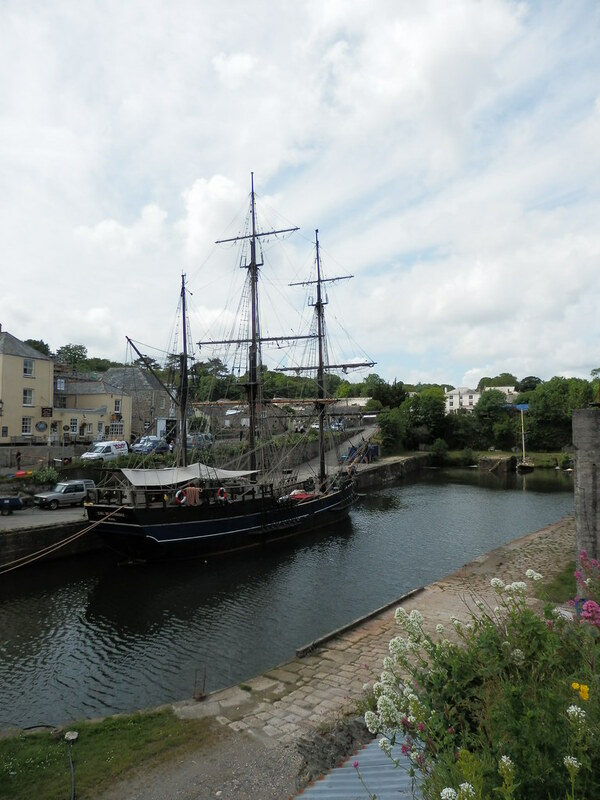 I really can’t recommend Swiftshore high enough – it was everything that the place in St Austell wasn’t, showing quite clearly that a good B&B isn’t necessarily about nice shiny facilities and that a bit of friendliness and hospitality is so much more important. A mere £9 more too and the second cheapest night’s stay of the trip, this was easily the best B&B of the trip at any price. 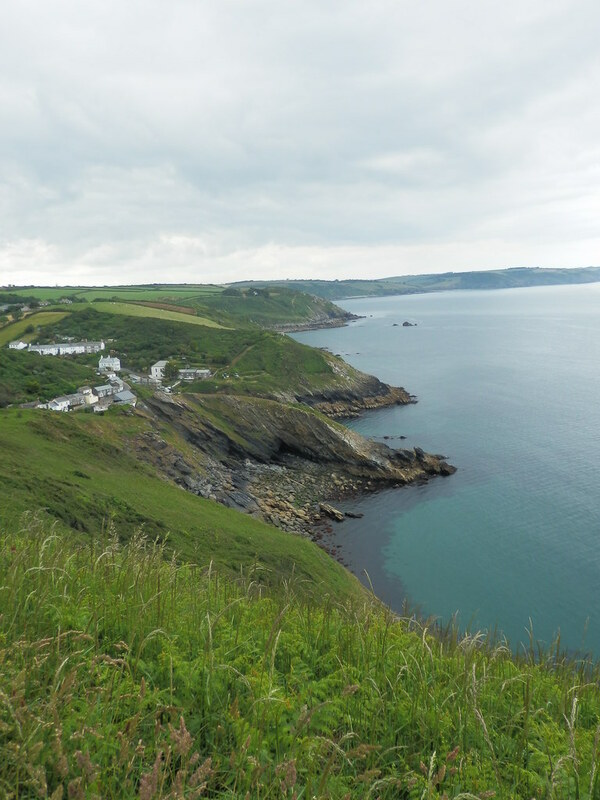 The downside, however, was the down at the start of the day back into Gorran Haven to rejoin the coast path which of course immediately climbed back up onto the cliffs. Hay fever still very much in the driving seat, I hoped at least for paths that were wider than my foot today, but I was only partially successful. 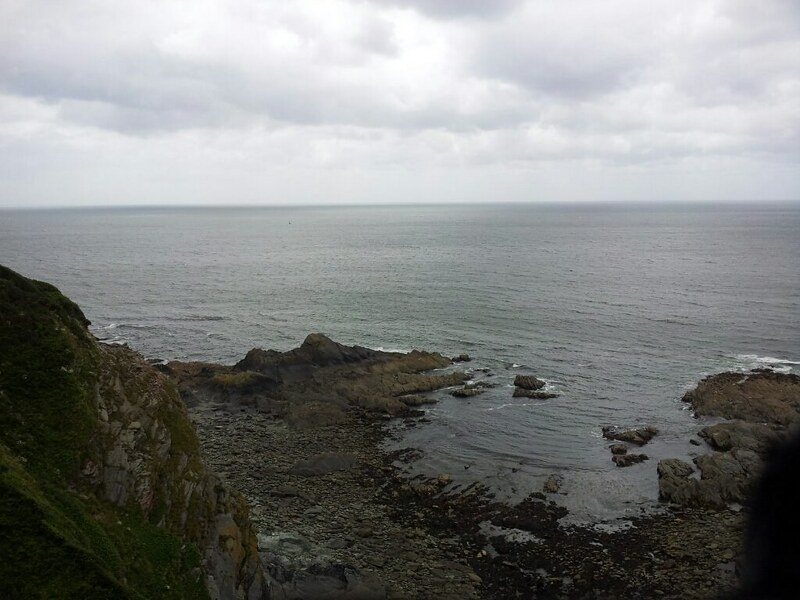 We made our way steadily along the cliffs, heading for Dodman Point. We turned the corner and gently descended to Hemmick Beach, one of many Cornish beaches that seems to be miles from anywhere. A gentler walk but getting warmer all the time, we struggled and sneezed on to just above Portlune Cove, where a conveniently timed bench prompted the coffee stop. A group of Germans, whose van we’d seen parked in Hemmick Bay, stopped to chat. It’s a long drive to Cornwall from our home, let alone Germany, but they certainly seemed to think it worthwhile. 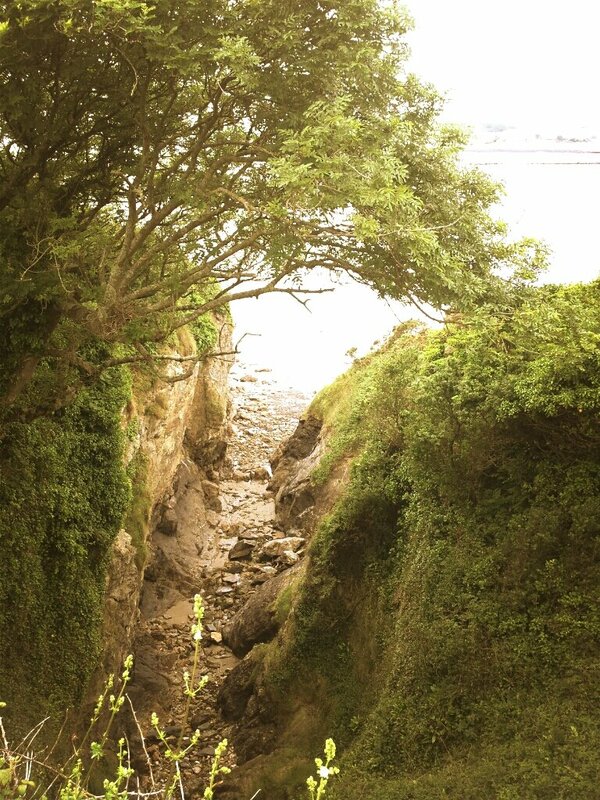 We walked past Caerhays Castle and climbed back up onto the cliffs. East and West Portholland were non-places really, explaining why my pre-walk research hadn’t yielded much on them. 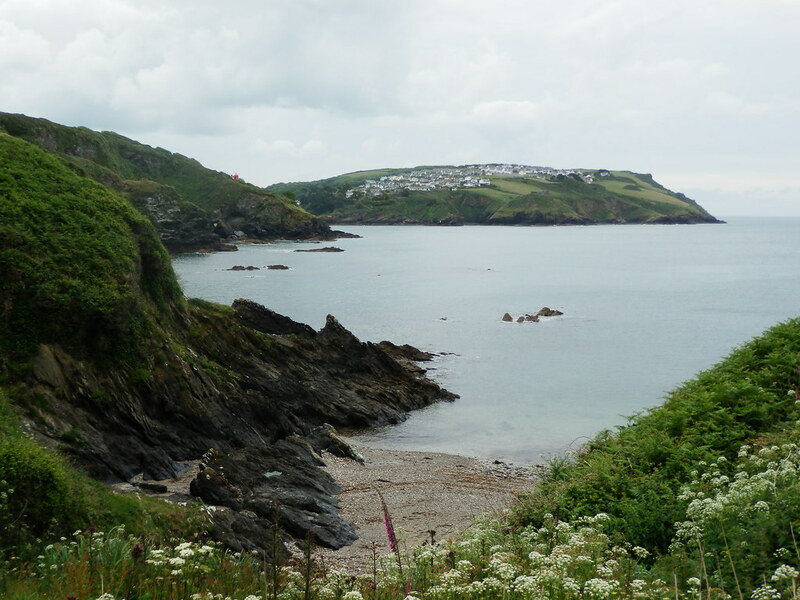 We carried on starting to look for a suitable lunch spot – ideally I hoped we’d get as far as Portloe, but the heat and our pace didn’t make this happen, so we found a pathside spot somewhere near Tregenna. The afternoon was one of those walks were you can see somewhere you’ve got to get to, and in fact past, the whole time and it doesn’t seem to be getting any nearer. Portloe, reached at viable ice cream time was bereft of ice cream, and we pushed on, slogging our way towards Nare Head. Then the signs seemed to give out and we found ourselves cutting through nettles and ending up at the foot of the cliff with an iffy scramble around the point ahead of us. Retreat was agreed. With progress not having been that stunning today anyway, we were starting to flag badly now and we staggered into Carne Beach. Both of us sensed that this was going to hurt us tomorrow – a day when we had nothing to play with in the schedule because of our travel arrangements. As we ground out the last bit to our overnight stop at Trewithian Farm, thoughts of abandoning the last day started to germinate. Dad clearly wasn’t up for it, and I knew we’d have to really go for it to make the ferry crossing we needed to get our booked train. So I started to rationalise and justify a stop decision as we walked. We cut inland to the A3078 and walked along it the last couple of hundred yards to the farm. I’d booked Trewithian Farm last year for the equivalent night but because we’d culled the walk, Id managed to cancel it in good time and get a full refund. With very sparse accommodation options in this area (or at least sparse in terms of what I could find online), I’d simply rebooked it for this year. We turned up with about 15 minutes before the reception curfew and were shown to our room. Friendly enough welcome, but we could tell from the start that this place was definitely run as a business. It just had that different feel to it. Everything was fine and Dad was pleased that we had fresh milk for the mandatory post-walk cup of tea, but it was never going to match last night. The nearest pub was, as feared, in Portscatho so a 3 mile round trip for dinner ensued, much of it along a busy main road. We also had to wait for a table at the Plume of Feathers, demonstrating we’d probably chosen the best place. Dinner was good and probably my favourite pub of the trip. Whilst there we confirmed the plan for the next day. We’d pick up a bus to St Mawes and the ferry to Falmouth and go home, not risking the walk and the chance of missing our connections. Both of us were happy with the decision – Dad had had enough after our hardest day, and I was ok with that too. It also gave an intriguing possibility for next year whereby we could spend two nights in Falmouth and do the first day as a light pack walk by reversing tomorrow’s travel and then walking back to the ferry. The attraction of this idea was what sold me on it. We headed back to the farm for a decent night’s sleep. One of the other factors in our decision to stop the walk here was the late breakfast, but now that didn’t matter as, if anything, we now had time to kill. We packed up and walked down to Portscatho to get the bus. After a hot wait in the bus shelter we were on our way and soon in St Mawes. With a slow-moving queue for tickets we only just made the ferry to Falmouth. We walked along the main streets looking for somewhere for lunch, rejecting (naturally) all of the seafood and ending up in what can only be described as a “sailors’ pub”. Garishly decorated outside and arranged inside so that only relatively low value damage could be caused after a punch up, the Ship seemed a bit of a risk. We were the only customers and so chose a window seat to sip scrumpy while we waited for lunch to arrive. What turned up was stunning, at least in comparison to what I’d expected. Expecting food to just be thrown on the plate, it was well-presented and tasty and of a decent standard. Appearances can certainly be deceptive. We finished up and rushed through the streets for emergency fudge gifts and snacks for the journey home, making it Falmouth Docks station just in time. 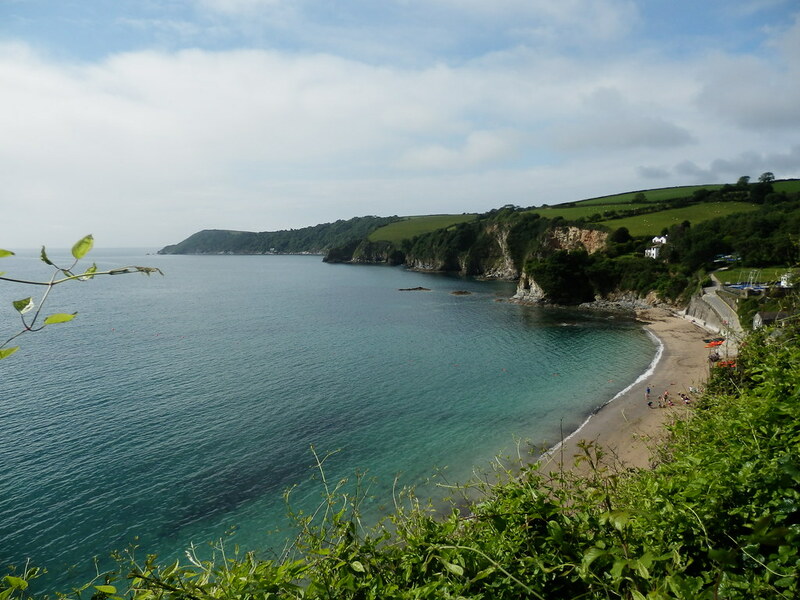 We were so lucky with the weather this year – the only rain was a few spots as we arrived in Looe, and apart form that it was warm and mostly sunny, but somehow I also didn’t get as sunburnt as usual. Of course I now know that this was the proper start of summer and the current heatwave, but at the time it looked like a successful and lucky dodging of the rain. I think we both came to the conclusion on this year’s walk, that under those conditions a daily distance of around 10-12 miles is most comfortable. The last day was definitely too long, and indeed was the longest SWCP day we’ve both done, only just eclipsed by my solo day 1 from Plymouth to Crafthole last year. None of this was helped by the fact that on 3 of the 5 nights we had a long walk to the pub each night, adding 2-3 miles a day to our totals. But the thought was also voiced for the first time, that Dad might not want to finish the path – the “I’m not getting any younger” conversation. Decoded this means that I could find myself potentially planning subsequent year’s walks two ways – one less aggressive walk of 10-12 mile daily sections, and one a bit more epic in the event that I do the walk by myself. I certainly want to finish it, and if I find myself soloing at some point then I think I’ll also consider wild camping it. Indeed, as we walked this year I tried to assess the likelihood of suitable pitches by looking out as we went. If I’d wild camped this year, I’d have found some really nice spots. 1st – Swiftshore, Gorran Haven – £64 for a family room. Very friendly and un-commercial in style. Can’t recommend highly enough. 2nd – The Well House, Fowey – £70 for a family room. Again friendly and of a good standard all round. Chosen because I stayed there last year. 3rd (joint) – Trewithian Farm – £70 for a family room. A decent large room with everything we wanted but a bit impersonal because it was very clearly run as a business. 3rd (joint) – Little Harbour, Looe – £70 for a twin. About what I’d expect, but the owner was very friendly making up for the fact it lagged the others in terms of facilities or quality. 5th – Pen Star House – £55 for a twin. On quality v price this should have been the best, but we were made to feel so unwelcome that I rated this as poor. We’re not the only ones to have had a less than uplifting experience there either, it seems from the reviews. The walk itself, whilst pleasant and something I’d been looking forward to, I wouldn’t describe as one of our classic years, and stunning scenery of Dorset seems a long time ago. At times it felt like hard work and there were long stretches where we were shielded from the actual coastline by trees and undergrowth. I also started to get a little bit “remote Cornish cove’d” out. Certainly it was rocky and picturesque, but I found it quite difficult to work out where the places were when going through the photos. It probably didn’t help that I’d done the first two days of the walk last year anyway. 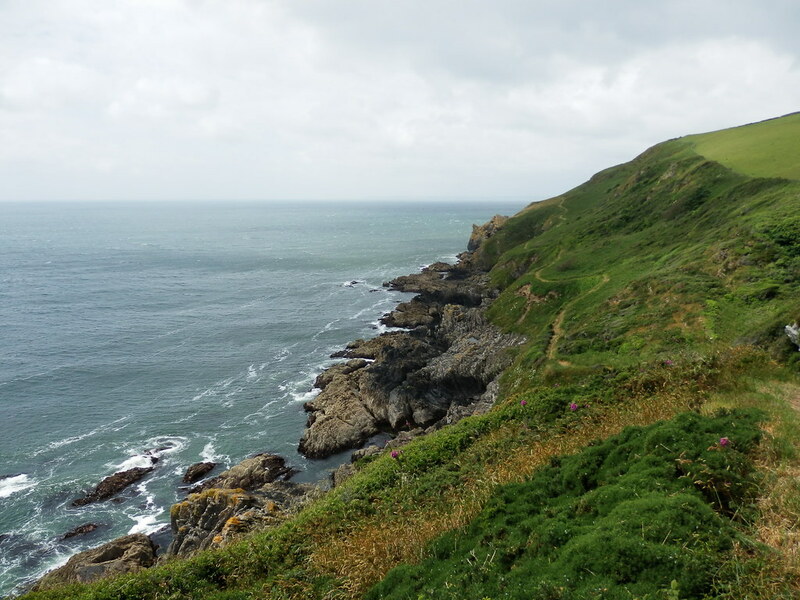 The slightly repetitive nature of the coast now means that we’ll probably look to limit the next couple of year’s trips to around 4 to 4.5 days walking – any more than that and I sense we might get bored. Don’t get me wrong, the scenery is stunning and it’s way better than being at work in London, but after several days it does get a bit samey. Kit-wise, I made some good choices this year. Last year my Golite Jam was bulging, but this year I found spare room and it felt lighter. Replacing the supplied foam pad with a triple folded piece of tent underlay made quite a difference and it was a comfortable carry the whole trip. The SWCP is classic trail shoes terrain and my Saloman X Ultra’s did the job well. I didn’t go silly with clothes, but unlike previous years did take jeans for the evening. This was purely because they seem to hold magic TARDIS-inducing properties – in past years my brother has packed a pair and had loads of room in his pack, whilst I’ve tried to go light and have struggled to get everything in the same model of rucksack. So this year I took jeans and some decent footwear for the evening and hey presto! In the circumstances, a waterproof and softshell were overkill and I could have got by without either – but it’s never a great idea to risk having no weather protection. Both spent the week at the bottom of my pack. 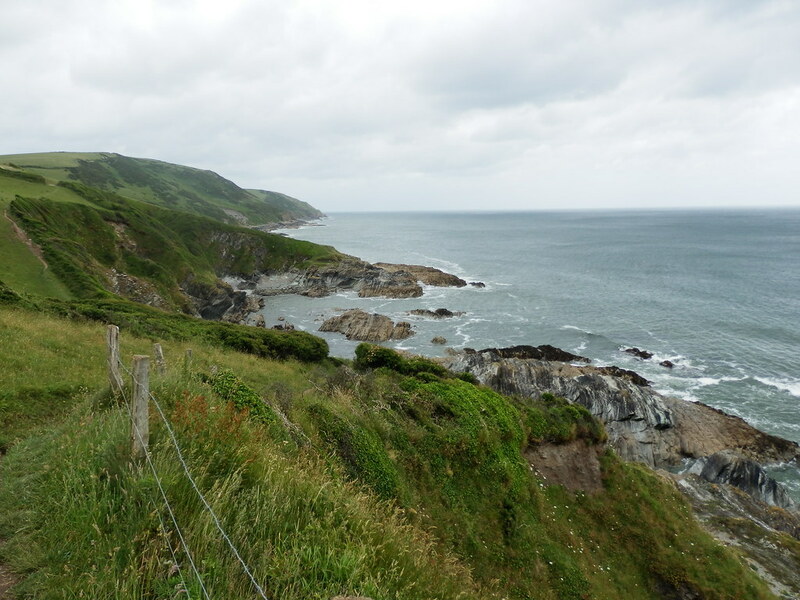 Day 4: Gorran Haven to Trewithian – 15.84 miles and 664m of ascent. 7:40 hours. Extra 3 miles to pub and back. 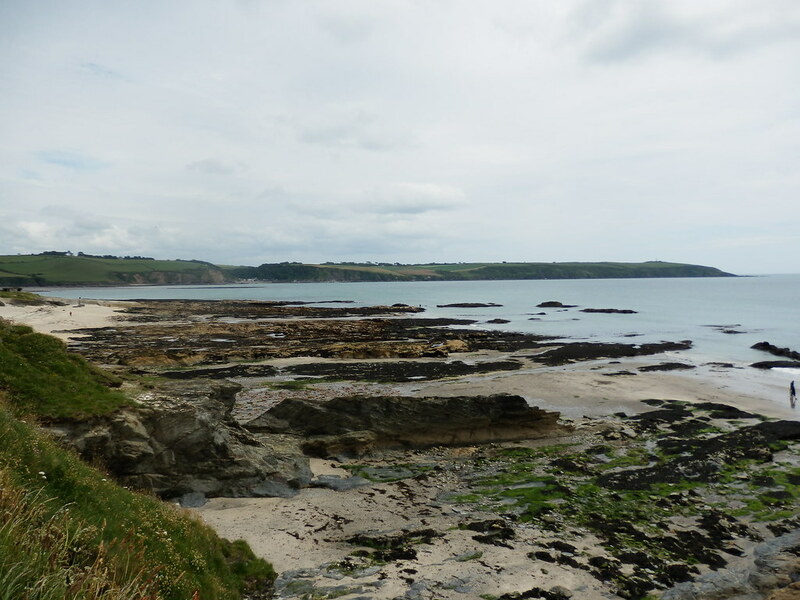 Day 5: Trewithian to Falmouth – walked the 1.5 miles to Portscatho and then transport to Falmouth. Total Mileage: 51.74 actual SWCP, plus 9 of extras.